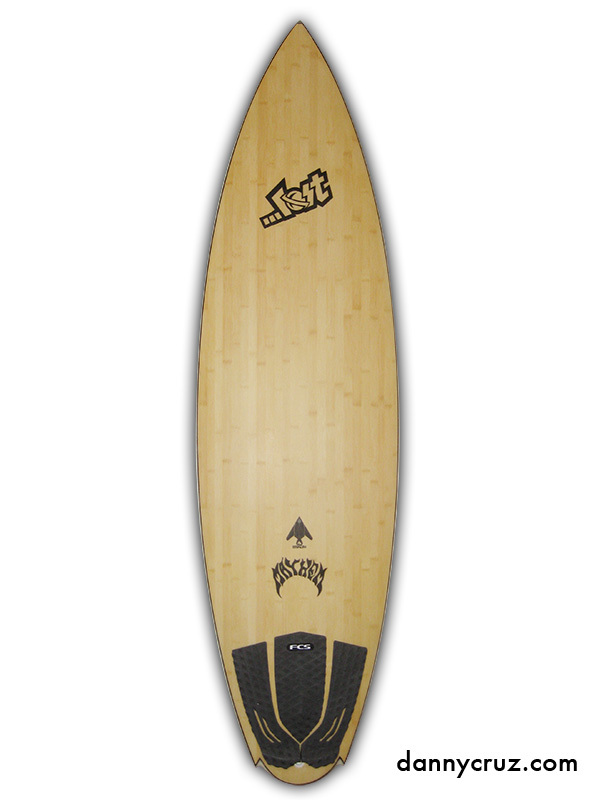 A couple of months ago I wrote a review of a 6’0″ …Lost Stealth FST surfboard made by Firewire. Click here of you want to read that post. Recently, I’ve been really getting into Rapidfire technology also by Firewire. A buddy of mine was interested in my the FST Stealth so I sold it to him and ordered myself the RF version. I had to wait a few months as these new boards were still in production at the time. I would be receiving a board from the very first batch that landed in the US. The Rapidfire boards are made with epoxy and EPS foam. Different than the FST constructed boards, the Rapidfires feature carbon fiber rods inside the foam rather than parabolic balsa rails. The carbon rods sit inside the foam a couple of inches from the rail so they are technically also parabolic. The other difference is the skin of high density foam that the FST boards have on the deck is replaced by a bamboo top. This thin layer of bamboo not only looks good, but it’s very strong and adds it’s own signature touch to the boards flex characteristics. The bottom does not have a skin of high-density foam. This makes the bottom a bit more vulnerable to dings than FST tech, but it’s still stronger than a standard polyurethane (PU) surfboard. 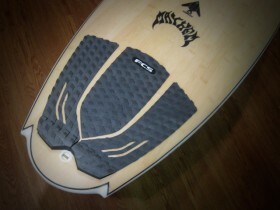 The board rides similar to the FST version I had apart from a few subtleties. I adjust pretty well to the difference in feel, so I’m happy with either FST of Rapidfire tech. However, I do have friends that swear by one or the other only. I really enjoy the look of the bamboo but I admit I miss the beautiful and clean white finish of an FST board. 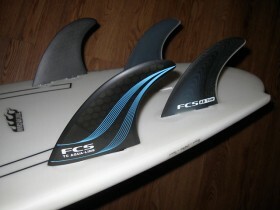 For fins, I first set it up as a quad with FCS TC Aqualines in the front and AB-Tow side fins in the rear. For the second session I opted to change the Aqualines for a pair of FCS Goods-1. I liked that setup a little bit better for some reason. Mainly just feel. The AB-Tow fins are staying in the back for now. Those are made out of G10 and are top quality fins. The traction pad I opted for is a FCS T-1. It fits the board perfectly and I really like how it enhances the “stealthy” look with it dark charcoal grey color.